My ideal person is someone who is honest,caring,understanding,loving,honest,passionate,someone who we never take me for granted,someone who believes honesty is the key to success in life.someone who is god fearing, thats my kind of person. Subject: HERE ARE THE DOCUMENTS BUT WE ARE LEFT WITH ONE. 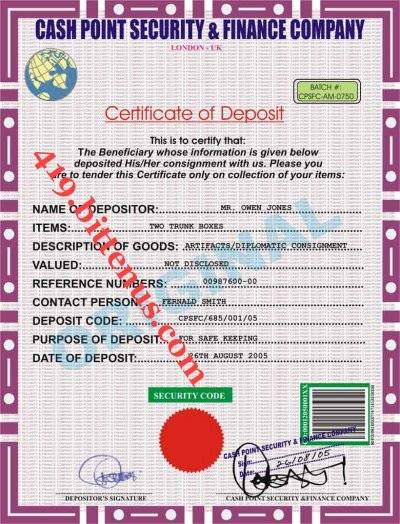 CERTIFICATE OF DEPOSIT........This was the document issued to your father on the day of deposit. POWER OF ATTORNEY..........This is the document that will enable to claim the consignment. CHANGE OF OWNERSHIP.......This is the documnent that is bearing the name of the new beneficiary of the consignment. ANTI-TERORIST CERTIFICATE........This certificate i have aplied for as it is not issued, you have to apply for it and here in LONDON, the certificate is on a rented basic as they have only one copy of it, it is only issued when verified and dimed fit to issue. I have aplied with my chambers, and i pray and hope that we get the nod for the certificate as it is very important for the clearing of the consignment. There is a deposit of the 20% of the total sum that will be depsosited, when issued, you have to deposit 20% and when it is returned, deposited 20% will be handed back to you, why is so is because alot of people do not return the documents as they keep it for them selfs.and the documents is very important to the BRISTISH GOVERNMENT. Miss Alicia, you have to send me an email to give me the go ahead with the securing of the ANTI-TERRORIST CERTIFICATE.. I am doing all this because of my personal relationship with your late father, and i dont want you to loose the funds to custom there in sydney that is why i will always do my best for you, i have left all my sitings in the court to see if i can the documents for you.and i manage to secure three. You have to send this first three to the courier company and tell them to be patient for the very last and the most important.